You can use Silver Efex Pro perfectly effectively by choosing a preset and then modifying the settings as necessary using the tools panel. 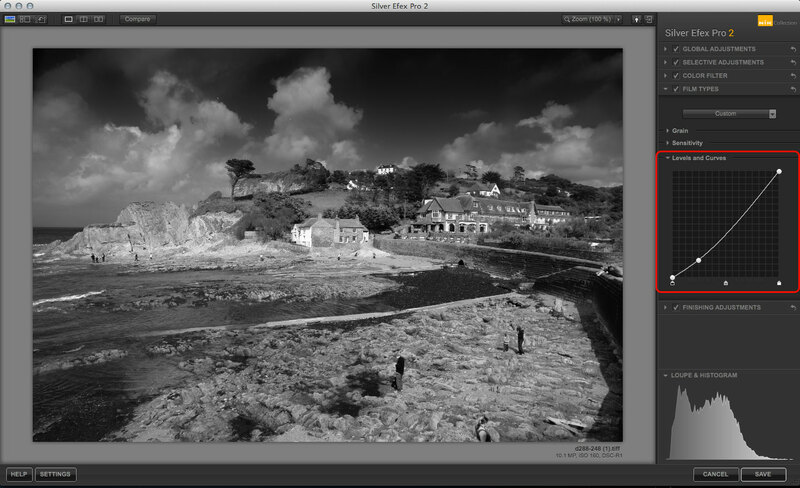 What you may not realise is that Silver Efex Pro simulates specific film types very closely. In fact, you can choose your film manually in the Film Types panel. And if that’s not enough you can create a black and white film of your own with the Silver Efex Pro Sensitivity settings. These alter the spectral response of your film – in other words, the way it reacts to different colours of the spectrum. Early black and white films were ‘orthochromatic’, which means they responded mostly to high-energy wavelengths at the blue end of the spectrum, but were insensitive to lower-frequency colours like yellows and reds. This meant that blue skies would come out so bright that they lost all tonal separation, and white clouds were barely visible. Landscape photographers, though, wanted blue skies to be dark, and clouds to be light and fluffy, so when ‘panchromatic’ films came along, photographers were much happier because now films were equally sensitive to all colours of the spectrum. Even so, blue skies still come out a little too light, so landscape photographers regularly use yellow, orange or red filters to make blue tones darker. That’s the history lesson over. My point is that with Silver Efex Pro you can make a ‘film’ that’s the opposite of those early orthochromatic films. This one is more sensitive to the ‘warmer’ colours like yellow and red than it is to ‘colder’ colours like cyan and blue. It’s a ready-made landscape film that makes foliage lighter, blue skies darker and doesn’t need any kind of black and white ‘contrast’ filter to do it. Actually, you could get the same result with one of Silver Efex Pro’s Color filters, but this method is a little gentler and I like to think it’s a bit more technically elegant! My ‘start’ shot is above. 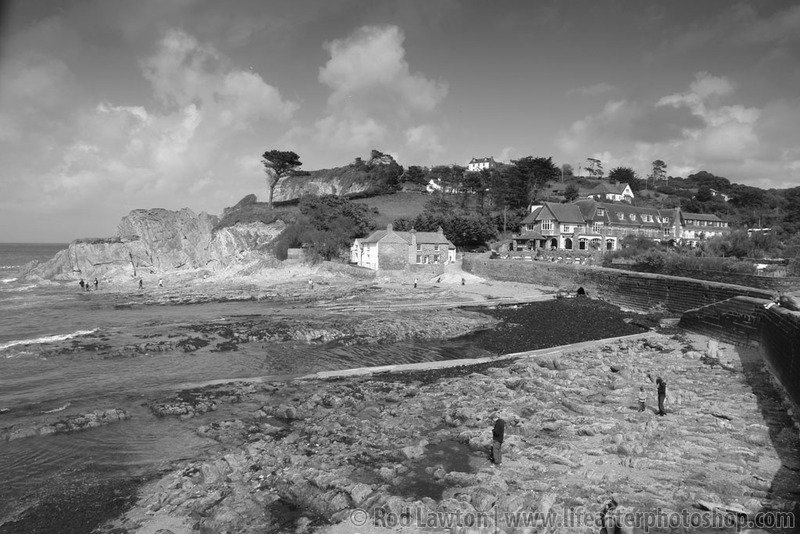 It’s a nice enough picture taken on the North Devon coast, but the standard black and white conversion leaves the blue sky lacking depth, and the whole picture is a little flat. 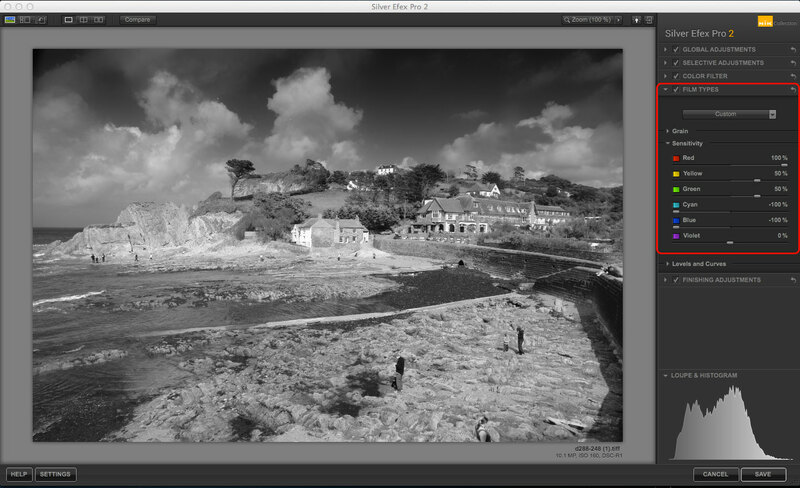 You’ll find the sensitivity settings in Silver Efex Pro’s Film Types panel. I think they’ve got the name wrong, though. They call it ‘Sensitivity’, which most people might confuse with ISO settings. I think they should have called it ‘Spectral sensitivity’, or the film’s response to different colours – which is what it actually is. To create the spectral sensitivity I want for my new film, I’ve pushed the Red slider to 100%, Green to 50%, Yellow to 50%, and Cyan and Blue to -100% each. This will make my film type less sensitive to blue/cyan (the colour of skies) and much more sensitive to reds, yellows and greens. Already, you can see the difference in the picture. The blue sky is much darker relative to the rest of the scene. The previous adjustment does make images slightly lighter than they were before (though it does depend on the colours in the original), so I’ve compensated by expanding the Levels and Curves section below, then adding a control point near the bottom of the curve and dragging it downwards. This makes the image slightly darker overall, and the happy side effect is a steeper curve in the middle and upper section, which slightly boosts the contrast.